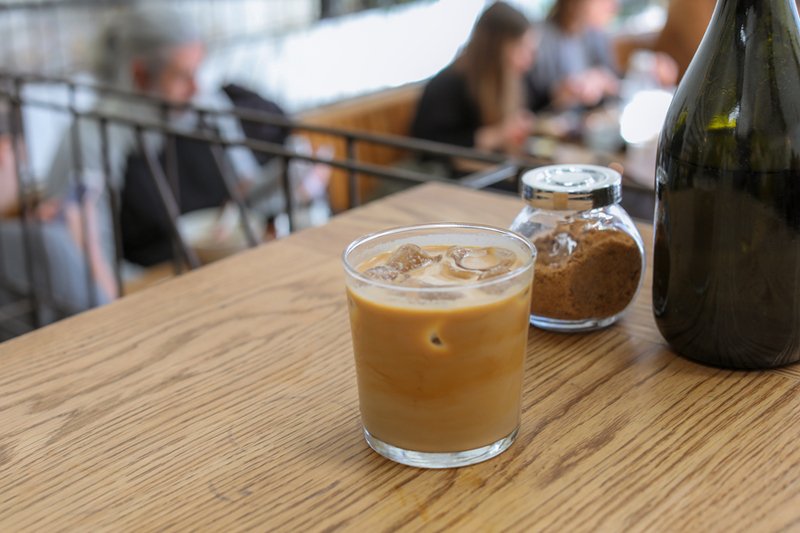 [Sydney] It is funny how we (our group of Singaporeans) keep heading to The Grounds Of Alexandria for coffee, but missed out Mecca Coffee just a short 10 minutes’ walk away. 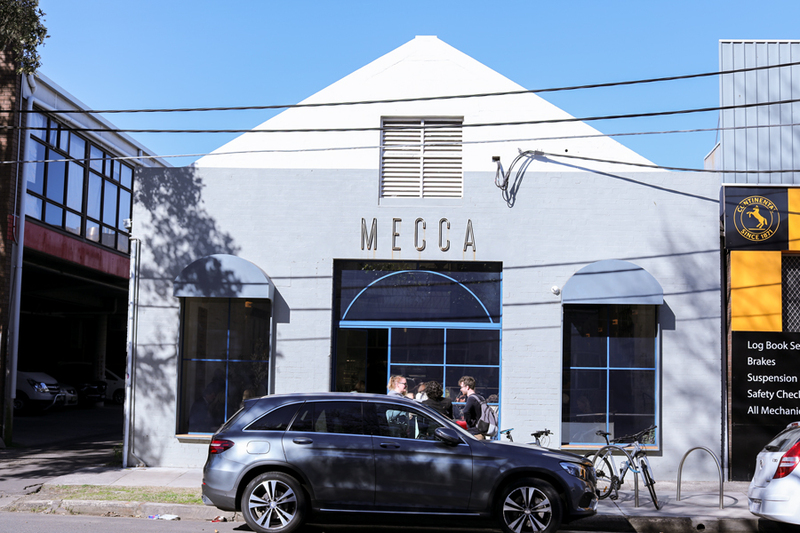 Mecca Coffee is an industrial styled café located in a warehouse in Alexandria, known to be one of the best speciality coffee shops available in Sydney. They also have other locations in Sydney, but the Alexandria shop serves as the central hub for their retail and wholesale operations. It is also where they roast the coffee beans and people can get a glimpse of the process. And guess what, we met the barista who was previously from Single O at Surry Hills and Neighbourhood. Industrial styled, the space ties in with the local area which has lots of warehouses, car shops and also an auction house. 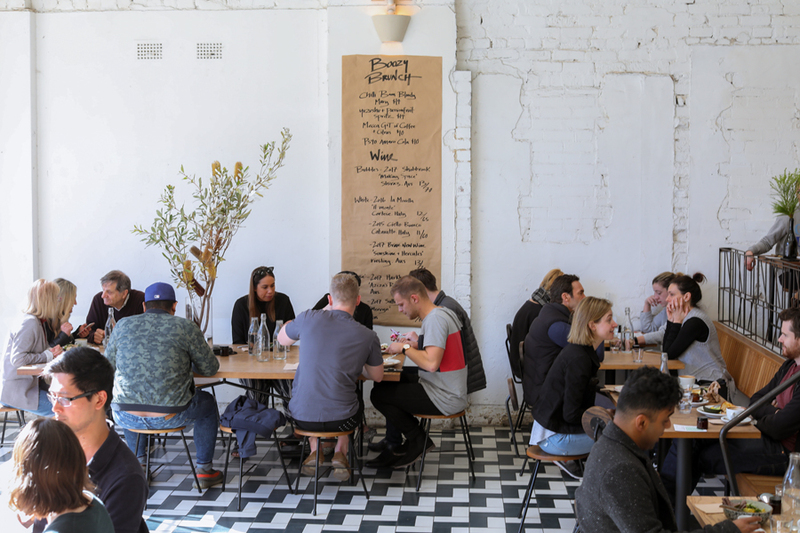 The fit-out was designed by Smith and Carmody, who have also styled some other Sydney café’s such as Excelsior Jones, Cornersmith and Brickfields. Inside, there are chevron floor tiles and a high A-frame ceiling, as well as a wrought iron railing that goes up to the mezzanine level. The walls are painted white, with a bit of dark brick showing through to give it a rustic/vintage look. 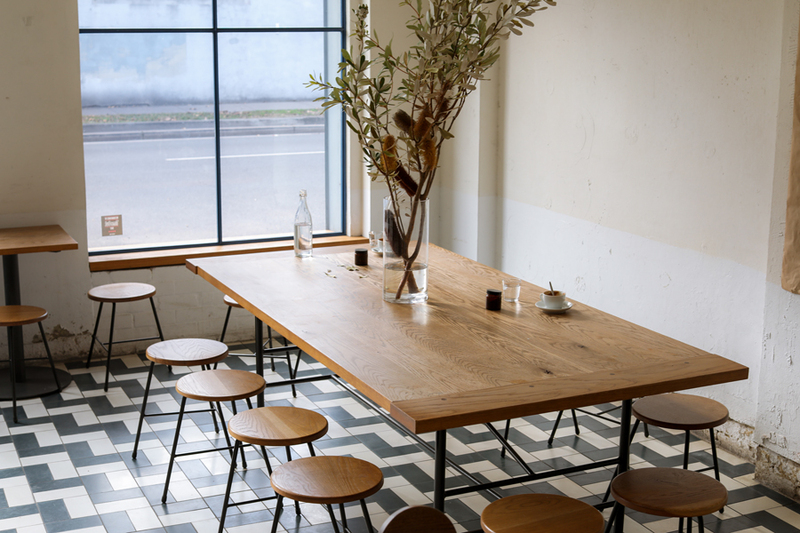 There are large tables made from wood, and there are also vases containing native flowers on the tablets and around the café. Look out for a garden located out the back, as well as a special room which is used for coffee training and cupping (tasting), which is held every Saturday morning. 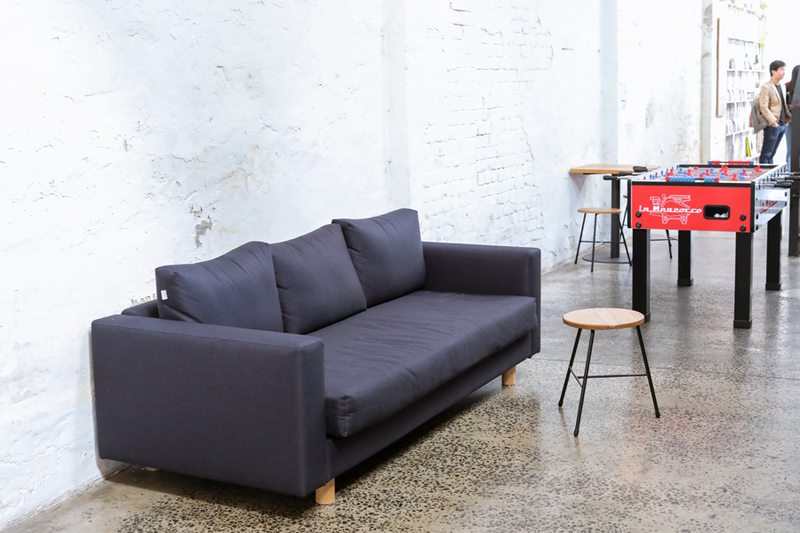 Overall a very minimalist aesthetic with industrial influence, a comfortable place to sit and relax either on your own or with friends. 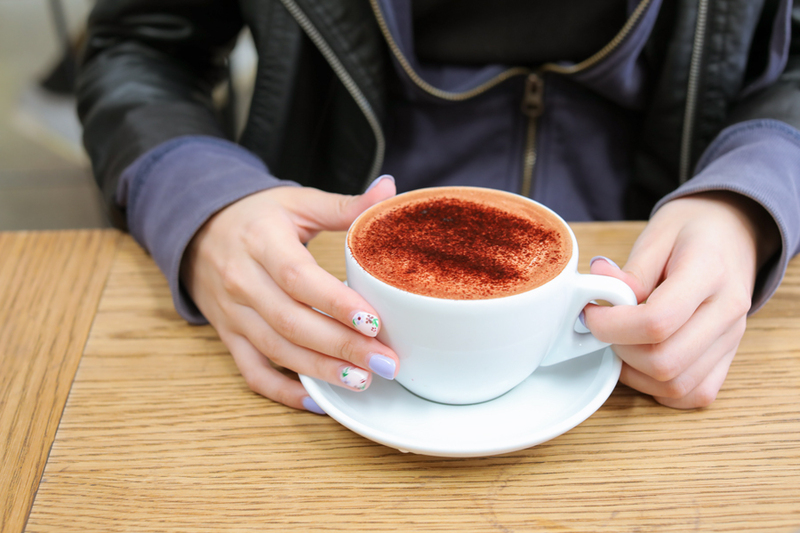 If you are a coffee lover, this is one of the best places to get your fix. 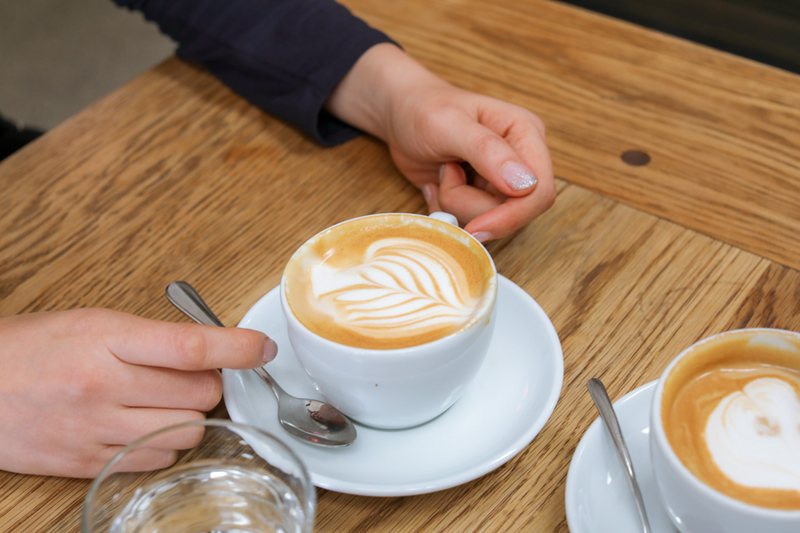 They are consistent and cater to all tastes whether it is espresso, pour-over or batch brew. They do “feature coffees” which highlight the best elements based on where the beans are sourced from. Coffee is priced at AUD4 (SGD4.03) for the regular, AUD$4.50 (SGD4.54) for the large, and AUD4 (SGD4.03) for filter. 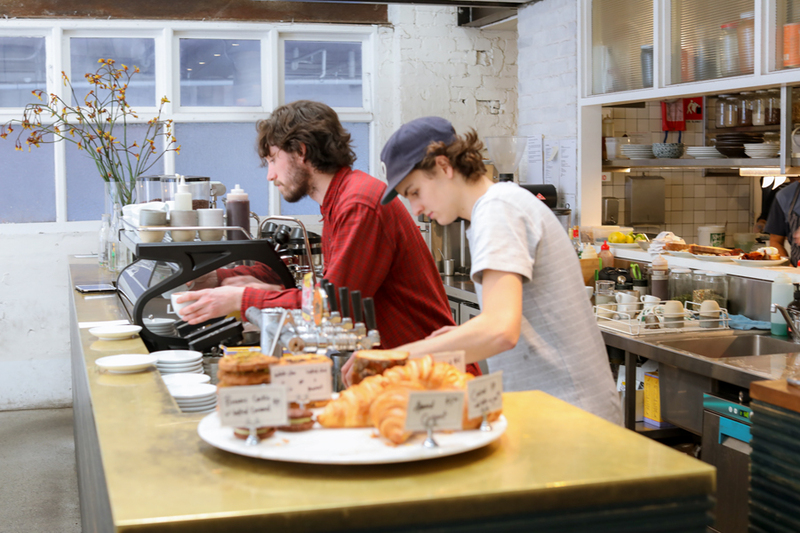 I must say they serve up a very good cup of cuppa – smooth and balanced, ranked among the top of those I had in Sydney. When it comes to this point, it really boils to personal preference, and I would have liked it to be more full-bodied. They also have a liquor licence, so you can get tap beers, wine or cocktails if you wish (after 10am). 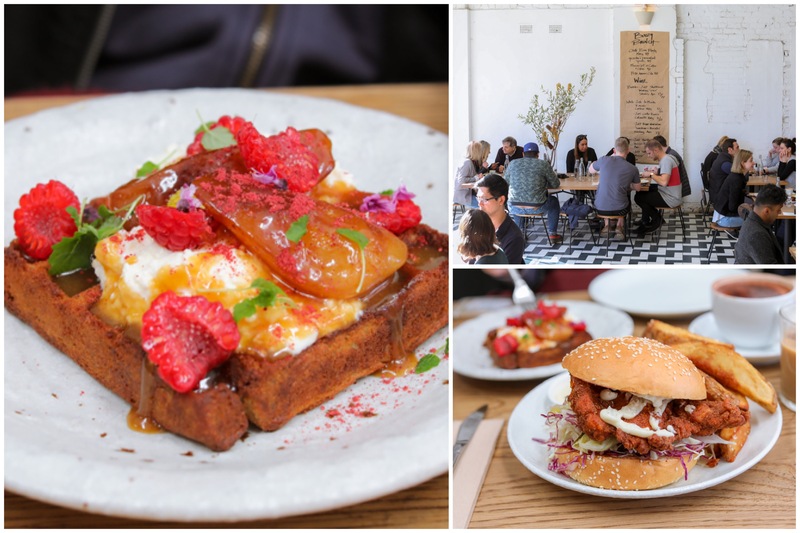 They do have a menu of dishes like Beetroot & Avo Toast (AUD17), Breakfast Plate (AUD18), Poached Eggs on Toast (AUD12), Mushroom Ramen (AUD20) – it is actually soba noodles, and Coconut Dahl (AUD18). Dishes change according to the season. 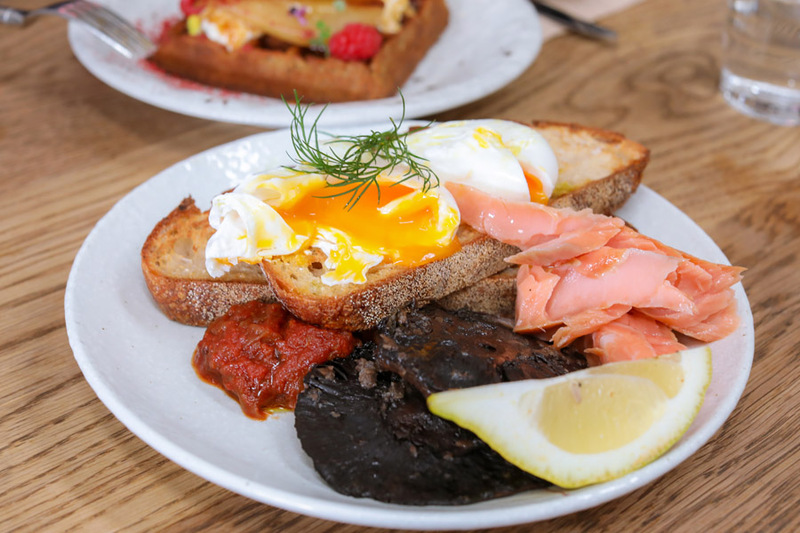 They make everything on site from scratch using quality ingredients (except for bread + pastries, which are brought in from Brickfields and Flour and Stone). Everything that was brought out looked really fresh and colourful, as they make use of seasonal fruits, vegetables and use ethically sourced meat and eggs. 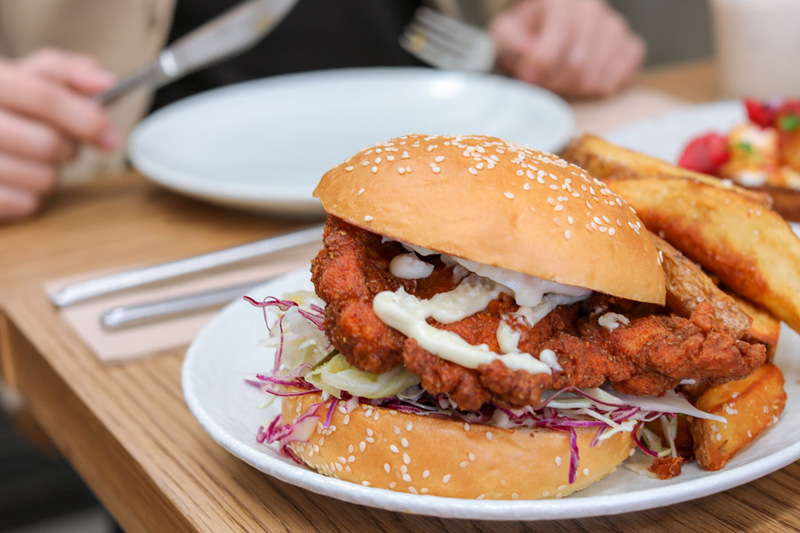 The Fried Chicken Burger which is called the “Chook Roll” (AUD) here, is a Korean inspired burger with fried free range buttermilk chicken, kimchi, cabbage slaw and aioli. 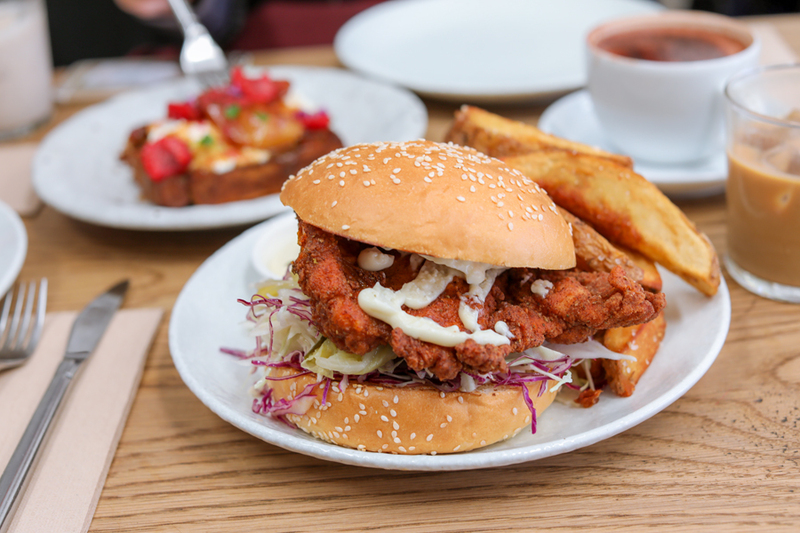 Everything went well together, from the soft buttery bun, succulent chicken to the tangy kimchi (not the spicy kind). I only wished that the chicken was of a slightly bigger piece to match up to the bun. I added Coffee Cured Salmon (AUD6) and Mushrooms (AUD5) to the Poached Eggs on Toast. While the former tasted fresh (I know, ironically since it is “cured”), it lacked of the coffee flavours I was looking out for. The mushrooms were absolutely deliciously, and I would so have the “The Nourish Bowl” (AUD16) of sautéed Japanese mushrooms, warm asparagus, eggplant and 63 degree egg the next time I come. 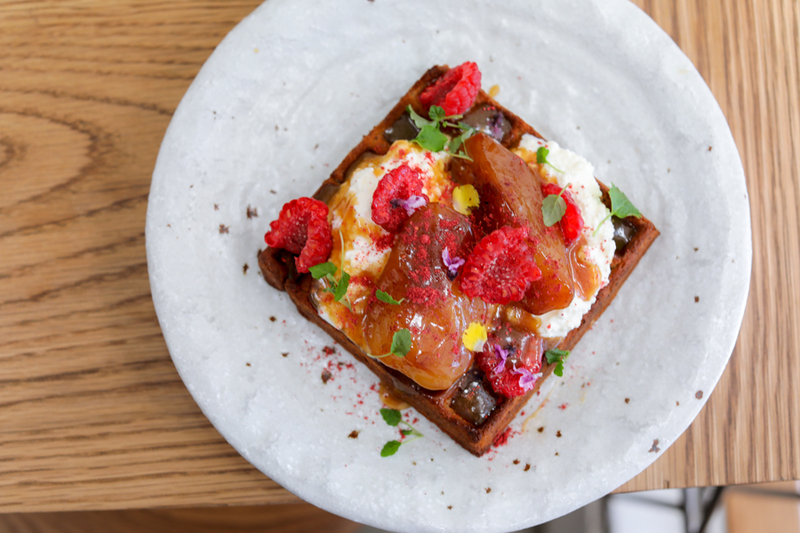 Do not leave without having an insta-worthy and tasty Buckwheat Waffle (AUD14), which was an absolute delight both to the eyes and palate. 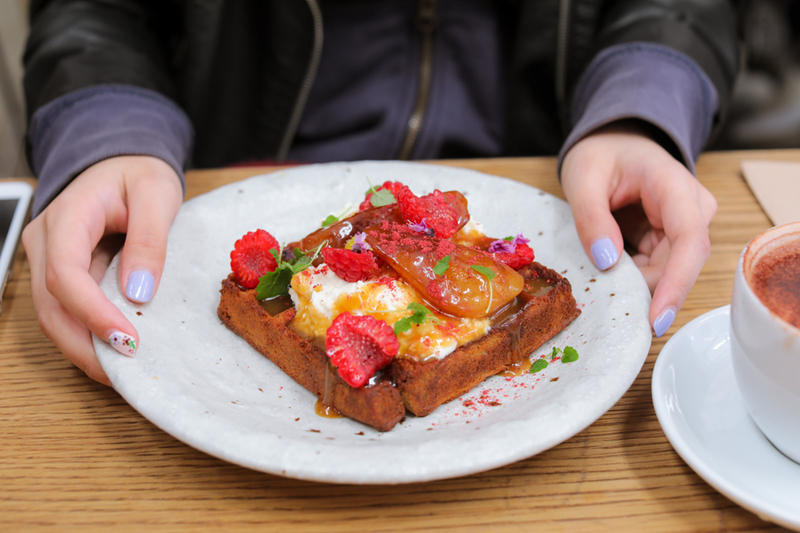 The texture was not the usual crisp Belgium waffle type we might be used to, and tasted interestingly cakey. 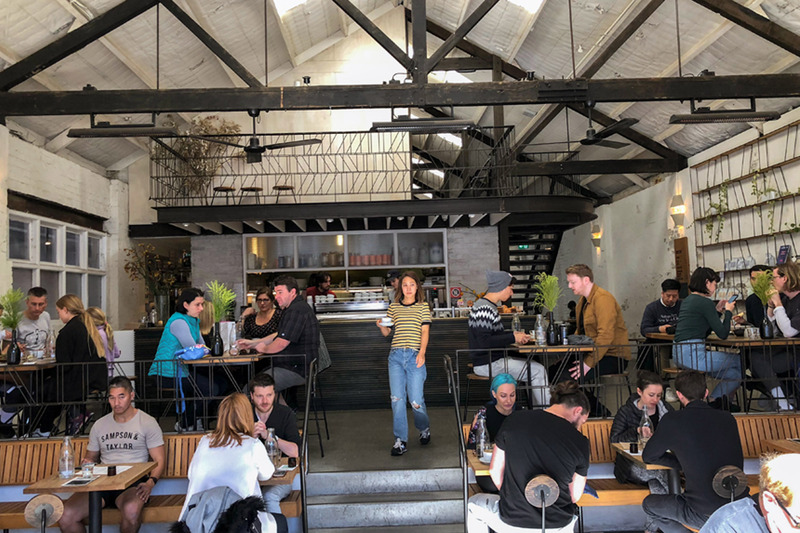 Mecca Coffee has a great atmosphere, friendly service, unpretentious industrial chic, and I will probably head back one day to try all more of their food.